In this corner, we have Microsoft's Xbox One, with games like Ryse: Son of Rome and Killer Instinct. In the same corner, we've got the PlayStation 4 with Driveclub, Knack and Octodad: Dadliest Catch. The first public hands-on for both upcoming consoles is underway. Though Microsoft has an Xbox Lounge set up up at the Manchester Grand Hyatt, the real battle is being waged on the show floor, in the crowded gaming front end of the convention hall, as Capcom, Popcap, Namco Bandai and Nintendo gather to watch. The lines around the booths were growing steadily, and last night was only preview night, where shopping is emphasized over sightseeing. Judging from fan reaction and activity in the booths alone, the PS4 would seem to have the edge, but again Microsoft has split its forces. Also, you can fit a lot more people into a booth when you aren't demoing a Kinect game. 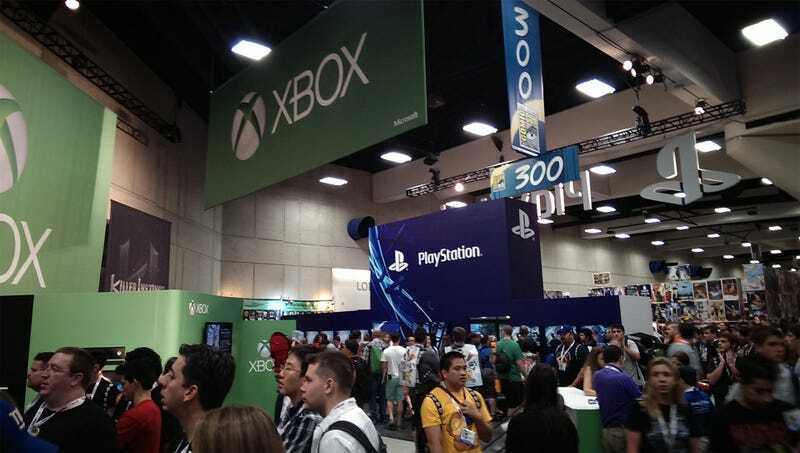 Today the 2013 San Diego Comic-Con officially starts, so we'll see how the booths fare with panels and other distractions in full swing. E3 was important to Sony and Microsoft, but here, where there are more fans than game journos — this is the true test.